Define up to 12 buttons. Define unlimited numbers of actions for each button. For each button specify if the window should close after the button is selected. Customize the AutoRun window size. Customize the AutoRun window location. Optionally add or remove window frame. Choose menu style from among large variety of included styles. Choose menu image from among large variety of included images. Customize fonts, size, style and color for titles. Use fill color for background. Customize fonts, size, style and color for button text. Run standard Microsoft Windows applications. Use Sure Run feature to ensure the file will open. Add installation of defined viewer. Open specified web site in browser. Can open HTTP. HTTPS or FTP site. Secure CD to a specific machine using MAC Address. Customize all the strings in the license dialog. Open Windows Explorer window to specified directory on CD. The Windows Explorer window can be opened maximized or at its default size. Print specified document using default viewer and printer. Open message window with specified text. Specify window title for message window. Choose icon for message window. Choose buttons for message window. If message box has Cancel or No buttons then they will stop further execution of AutoRun steps for button or quiet AutoRun. Automatically install software to ensure your document will open (ex. Acrobat Reader for PDF documents). When launching a standard document type (ex. PDF or Word) AutoRun Architect can add the installation of the standard viewer to your CD project. Viewer definition and installation file can be downloaded using the AutoRun Architect On-line Viewer Database. Run installation first time, every time or based on viewer status for specified file type. Install if no viewer found for specified file type. (ex. no viewer for PDF found on user's machine, install Adobe Acrobat Reader). Install software if version of installed viewer for specified file type is less then specified version (You require Adobe Acrobat Reader 9.1, install software if installed version is less then 9.1 or no installation found). Optionally display a customizable message before installing the software. Optionally allow the user to skip the software installation. Define file types handled by viewer. 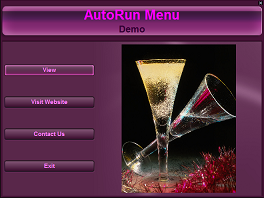 AutoRun Menu Wizard allows you to create an AutoRun in 6 simple steps that allows you to customize the title, choose the web site to open, choose email address to send mail to, specify file to open, choose menu style and image. Add actions before menus or after menus. Generates build report which lists any problems with the AutoRun definition. Burn all files in image directory to disc - no need to select files or directories. Supports multiple burners, user chooses which burner to use. Choose media type to burn to. Shows space usage on disc. Prevents writing of disc if there is not enough space. Optionally ejects disc once burn is complete. Allows disk to open quicker by telling Windows to open with AutoRun and not search disk contents. Specify directories to be searched for device drivers. Fully searchable Windows compliant HTML help.